The ASUS Blue Cave AC2600 WiFi Router Revealed! We were recently invited to the launch of the ASUS Blue Cave AC2600 WiFi router. 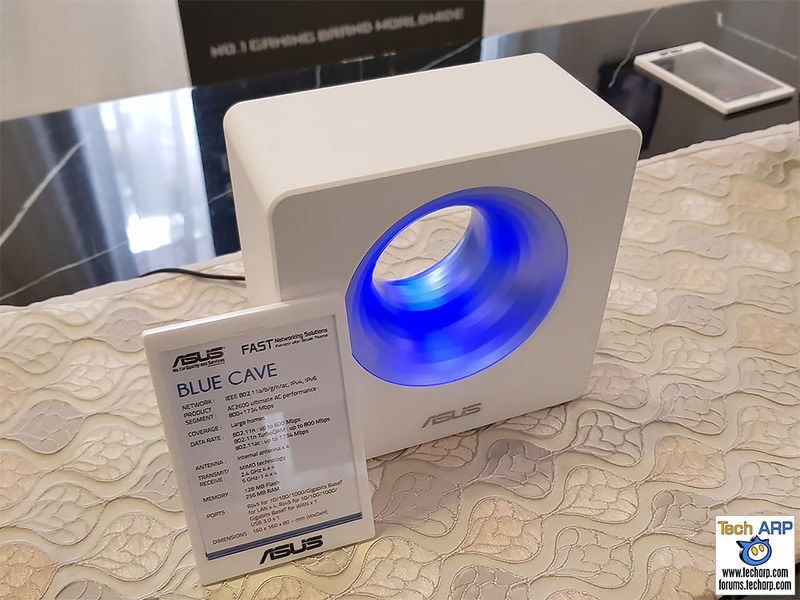 The Blue Cave is part of ASUS’ new line of lifestyle-focused WiFi routers, which include the ASUS Lyra WiFi mesh system. As such, it’s designed to not only work well, but look good. Let’s take a closer look! The ASUS Blue Cave AC2600 is a dual-band WiFi router targeted at non-techies. Hence, the emphasis on its aesthetics and user-friendliness. The name Blue Cave, incidentally, comes from the blue circular hole in the middle. We had an opportunity after the launch to get some hands-on time with the ASUS Blue Cave AC2600 WiFi router. Check it out! Its design requires the use of four internal antennas, but that does not mean it is less powerful. According to ASUS, it delivers a peak throughput of 1240 Mbps on the 5 GHz band, which is 20% faster than competing AC2600 routers using external antennas. ASUS AiProtection, powered by Trend Micro, is built into the ASUS Blue Cave AC2600 WiFi router. This protects all connected devices, including smart home (IoT) devices, from intrusion, infections and malicious websites. You can use the ASUS Blue Cave with other IFTTT-compatible devices and apps to create smart automated tasks. You can control the router using a smartphone or tablet. The app will also keep you updated with notifications about network activity, security reports and more. Parents can use the provided app to easily monitor and control every family member’s Internet and app usage. Previous : The ASUS Lyra WiFi Mesh System Revealed! Next : HP & Acer Introduce AMD Ryzen Gaming Desktops!